Aerodrom is a AirPlay server application for Microsoft Windows has been updated to version 1.1.4.0. Customers will get the latest version with the automatic update feature which is triggered on startup. Added display album info popup notifier (does not work for iOS 5 devices - Apple TV has similar problems). 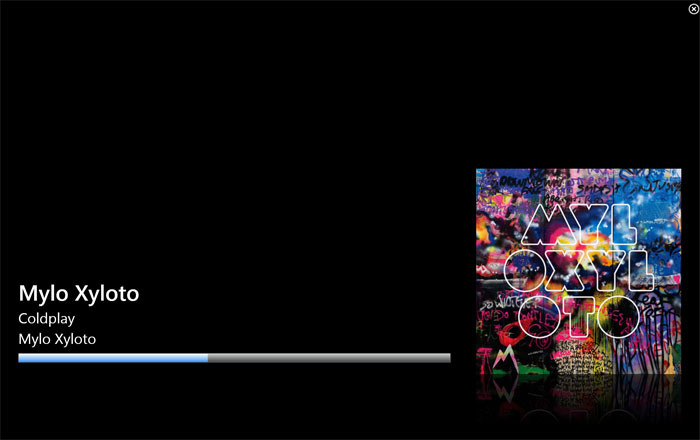 Added visualize album info fullscreen (does not work for iOS 5 devices - Apple TV has similar problems). Added selection of album info visualisation. Added iOS5 AirPlay photo caching. Changed communications to AerodromMCE (Pipes to TCP) - should now work with extenders. Fixed mousecursor problem on configuration dialog. Improved UDP receiption to lower frame drops. Added support for iOS 5 AAC audio encoding. (iOS 5 devices only). Added configuration settings for albuminfo and AAC audio. Fixed video start position when using Windows Media Center. Updated AreodromMCE to version 1.1.4.0. Some of the main improvements are that AerodromMCE is now automatic detecting Aerodrom. AerodromMCE does not need to be started - it is now started automatically and it stops playing other content. We also added album info display, which apparently worked fine as we started with this feature on iOS 4.x, but stopped working with iOS 5.0.1 (this info is not transferred anymore). Apple TV users experience also problems with this feature, but it does work partially there. Anyhow album info display still works for playing from iTunes. Hopefully this will be fixed with iOS 5.1. Video playback is still in our main focus. The release of VLC 2.0 helped only a little, because HTTP live streaming (HLS) is still not possible. Currently we put big effort in improving support for that and other currently unsupported formats. We put many hours of development in the support of AirPlay mirroring, but we found that without further knowledge of Fairplay DRM we will unable to support this feature. We will continue to improve the quality of Aerodrom and a big thanks to all customers who helped further development with their purchase, input and especially bug reports or beta testing. so does this program mirror everything on the ipad or only pictures and videos? @Anonymous: Aerodrom supports only audio, pictures and video. Mirroring is not supported right now.